Becoming a father is the most radical transformation a man will ever experience - on every level. Did you know (I mean *really know*) that as a doula, you are instantly a VIP in the world of an expectant dad?! Well, you are! Not just to mum and baby (which you probably already know, have experienced and embodied), but to dad as well. So...how do you serve dad, as well as mum and baby, AND stay on purpose? How do you make dad feel like a VIP, too? These are the questions we’ll explore during this interactive and experiential workshop. Working with men is a specialist skill set in its own right - just as doula training and serving as a doula is. However, this remains a gap in the education and experience of many childbirth professionals. The roles of men at birth have changed profoundly in the (relatively) short space of only a few decades, yet at a socio-cultural level, we haven’t caught up. That’s ‘why’ this workshop. You’ll gain powerful insights into the hearts and minds of men as they navigate this life-changing rite of passage, take a deep dive into your own practice as doula to reflect on your experiences, practical challenges, triggers, questions, triumphs (and more) with men, and learn new strategies, tools and practices that will help you build more confidence and stronger connections with ‘your dads’. Essentially, this workshop will empower you as a doula with greater awareness, knowledge and skills to make a deeper impact with the men you are supporting to become dads AND achieve better outcomes for the families that you are called to serve. Darren Mattock is a trained Working With Men Professional who has been practising as an Expectant & New Dad Specialist for the past decade. He has worked with hundreds of dads in community and engaged thousands online, facilitating birth preparation workshops for dads, co-facilitating birth preparation workshops for couples, new dads support groups and private support work with expectant and new dads. 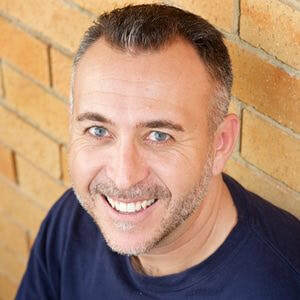 A key element of Darren’s work is educating childbirth and healthcare professionals, empowering them with tools, skills, knowledge and insights on supporting men becoming fathers. He has lectured student midwifes, presented at midwifery and motherhood conferences, doula trainings, and perinatal mental health workshops. Darren is a huge advocate of doulas, is a homebirth dad and passionate about making a difference in the birth, fatherhood and masculine spaces. He lives with his 10 year old son Charlie in the beautiful Northern Rivers region of NSW.